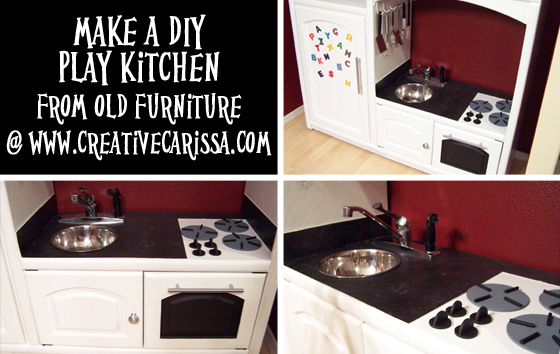 I know you all missed our DIY Play Kitchen goodness over Valentines Day. But we are almost done! 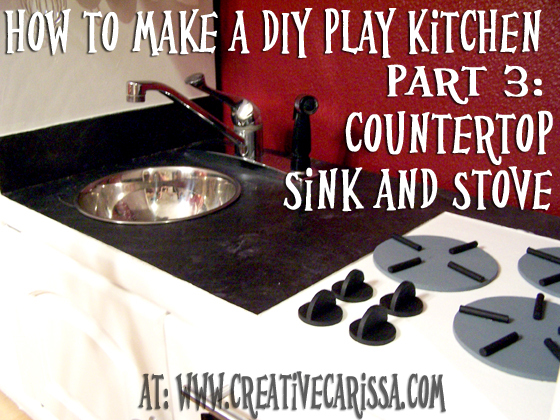 Today we are going to learn how to install the countertop / stove area. 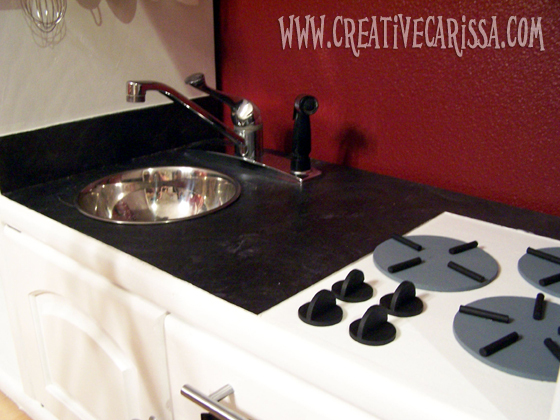 that includes the sink, faucet, stove and countertop material. If using laminate or contact paper, measure your work surface and cut your material to size. 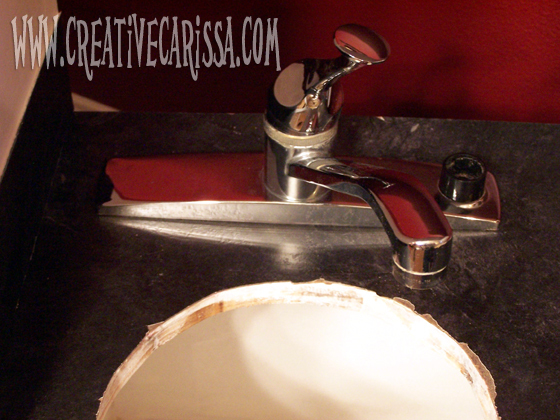 Cut a hole for the sink (whether you do this before or after gluing down the material will be best decided by the kind of material you use. I cut mine out before.) 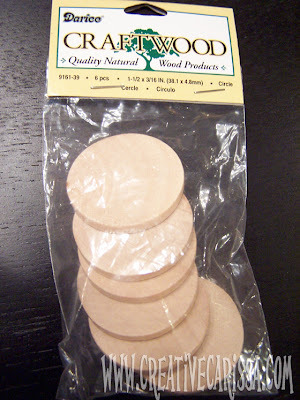 and glue down your counter using liquid nails following the instructions on the package. Add backsplash edging if desired. 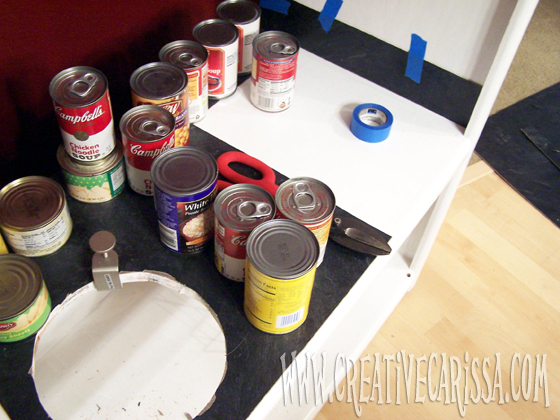 The cans are weighing it down while the glue sets. 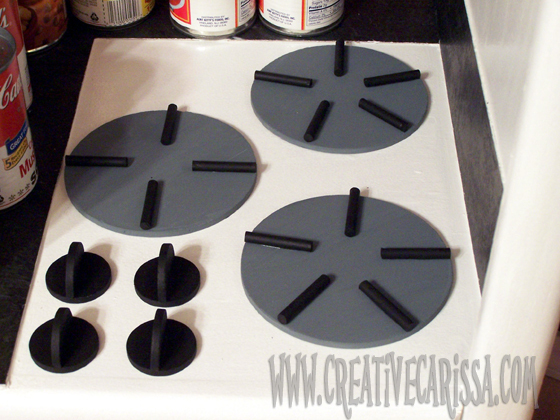 Liquid nails takes about 24 hours to set, so jump ahead and work on making your stove burners and knobs. 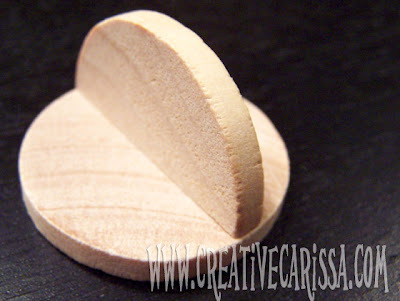 Use wood glue to glue a half circle on top of one of the full circles. Repeat until you have four knobs. Cut your dowels into approximately 2 inch pieces and paint them black along with the knobs you just made above. 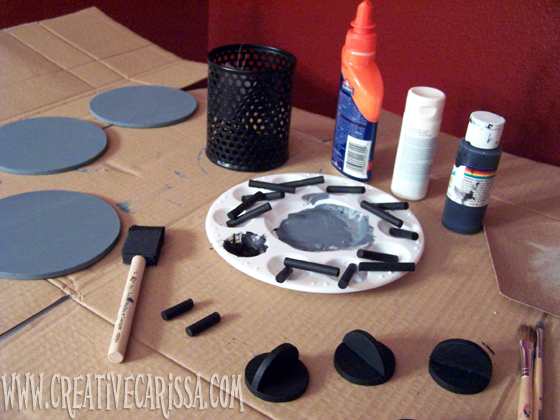 Once the paint is dry, glue the grey circles down to the stove area and then glue the dowels down on top with the craft glue. 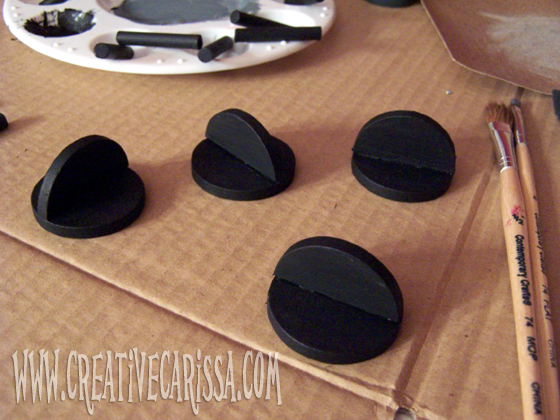 You can glue down the knobs, or if you want them to turn, you can attach them with screws. 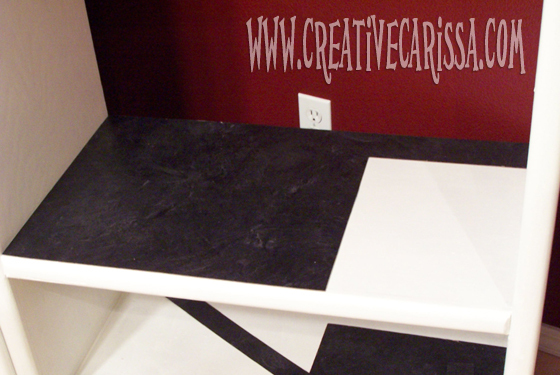 Caulk around the edges of the countertop material if you used laminate like I did. If you used contact paper or paint, skip this step. 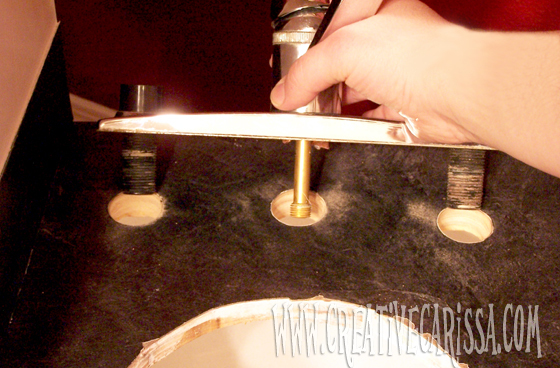 Now that your liquid nails is cured, we can move on to drilling our holes for the faucet. I used a real kitchen faucet that I got from free cycle so it had the hard ware sticking out from the bottom of it. I used a 1.25 inch hole saw to cut 3 holes. Then I dropped it in like a regular faucet and at attached it with the screws from underneath. Drop in the the bowl for the sink. 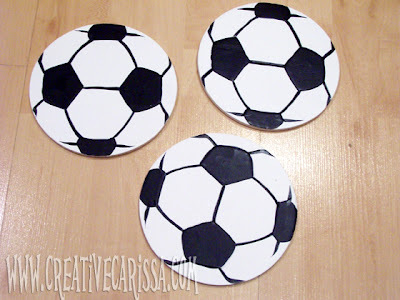 I didn't glue mine down in case we decide to play with real water and then we can pick it up and dump it out. You can glue your down with liquid nails if you'd like. 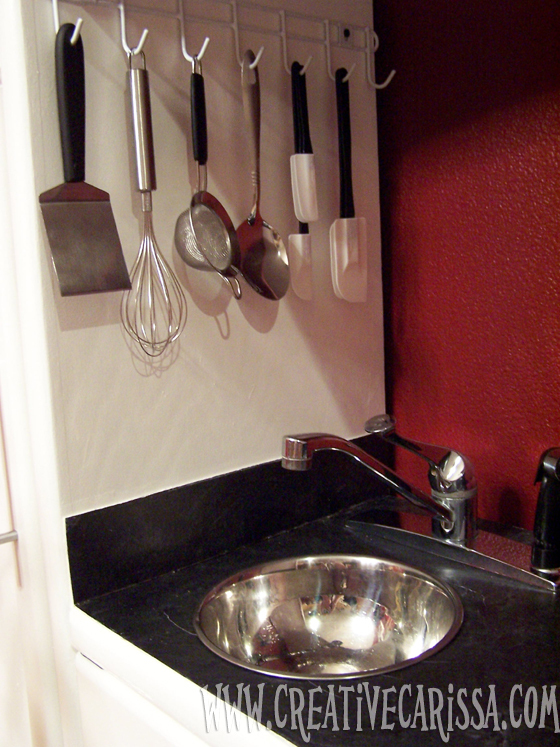 Attach the bar with hooks above the sink and hang your utensils on it. 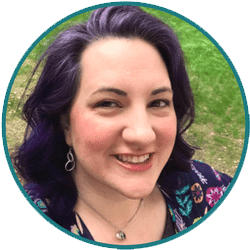 Sit back and enjoy your handiwork because you're almost done! Hi! 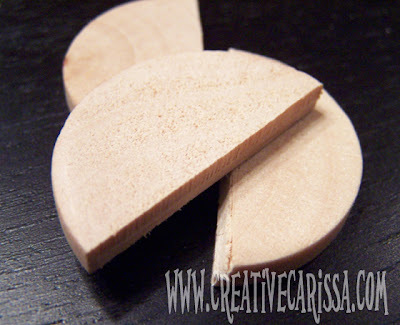 How did you cut your wood circle pieces for the knobs? And how would you suggest screwing them in so they can turn? What did you do for creating the oven door? I just painted the inside of the cabinet door black and added a bar-style handle. It doesn't actually open down, though. I left the hinges as they were.